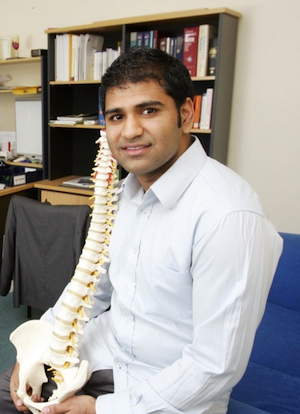 Dr Dias manages Perth Sports Injury Clinic, Swan Valley Chiropractic and Physiotherapy, and Complete Care Health Group. Receiving his Chiropractic Degree from Murdoch University in Perth, Western Australia, apart from his management roles he has had vast experience working with various musculoskeletal conditions and is willing to spend the time to manage difficult and complex cases. His approach is evidence based and patient centered management with his areas of specialty including headaches, dizziness, jaw pain and chronic pain. Dr Dias’ demographic patients range from workers compensation cases, motor vehicle injuries, geriatrics, children and professional athletes. He has worked in regional Western Australia (Bridgetown / Manjimup), Perth CBD and Hills region. In 2007, he travelled to India with a team of chiropractors and health professionals who provided healthcare to the underprivileged. Currently he rotates between his consultation rooms in Ellenbrook and Wembley. Dr Dias uses the specialised chiropractic techniques called Diversified, Gonstead, SOT, Drop Piece and Activator. These techniques can be performed manually with the doctor’s hands or by the use of mechanical instruments or the Chiropractic table. Dr Dias combines his Chiropractic therapy with kinesio-taping, rehabilitation and physiological therapeutics (including ultrasound, electrical muscle stimulation and micro current). If soft tissues therapy, is found to be necessary he may utilise myofacial release, dry needling and trigger point as part of your treatment. Dr Dias is also certified in the Webster Technique, a way of adjusting expecting mothers to optimise the biomechanical and neurological function of the pelvis during pregnancy and birth.